For a long time, it was assumed that tunnels did not need seismic design inputs as underground structures are less vulnerable to earthquakes than surface structures. It is now known that seismic waves are energy waves generated during an earthquake, and propagate through the earth’s layers. This causes the ground to shake, which in turn damages underground man-made structures. Some regions tend to repeatedly experience stronger seismic shaking than others. This is because the ground under these regions is relatively soft. Tunnels in soft soil under static and seismic loadings could even collapse due to ground shaking, soil amplification, cyclic mobility, and other design and construction problems. In addition, tunnelling in soft soil causes ground movement and damage to adjacent buildings and overlying facilities. Milind Patil, a research scholar with the IITB-Monash Research Academy, is working on a project titled ‘Tunnelling in soft soil under both static and seismic events’. He aims to understand the seismic response of a tunnel in soft soil, and subsequently develop a prediction model that will estimate tunnel lining forces and surrounding ground movement. The model can be adopted in design practices of underground tunnels in complex geologic conditions. Hung, C. J., Monsees, J., Munfah, N., & Wisniewski, J. (2009). Technical manual for design and construction of road tunnels–civil elements. US Department of Transportation, Federal Highway Administration, National Highway Institute, New York. Tunnel excavation in soft soil demands an immediate support system and meticulous lining installation. “My work focuses on simulating actual tunnel advancement similar to field conditions and incorporating the complex interaction between tunnel and surrounding soil using the finite element model. Under seismic loading conditions, tunnels may experience up to 35% more stress compared to static loading, and this can lead to an increase in the residual and permanent deformation of tunnel, if not considered properly in the analysis and design. These incremental stresses and deformation are sufficient to damage the tunnel and disturb the transportation system,” says Milind. Researchers like Milind are suggesting a rethink of the seismic design practice for enhancement of underground tunnelling systems. 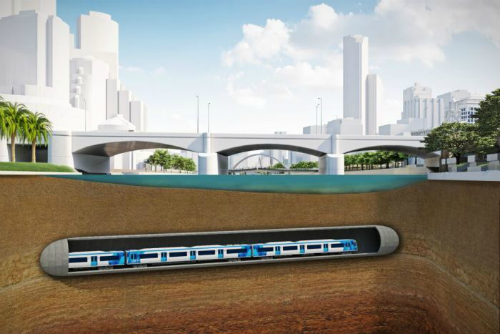 “In developing metropolitan cities, underground mass rapid transit (MRT) systems are gaining popularity because they provide an economical and efficient transportation solution. It is important that they are designed and built to safely resist all loads that they are likely to face during their service life. One common conclusion among the studies is that underground structures cannot be assumed safe under seismic loading if they are constructed in soft ground at shallow depth. Hence, a comprehensive analytical solution coupled with numerical modelling is necessary to model the effect of static and seismic loading on the performance of tunnels,” he emphasises. The IITB-Monash Research Academy is a collaboration between India and Australia that endeavours to strengthen scientific relationships between the two countries. Graduate research scholars like Milind study for a dually-badged PhD from both IIT Bombay and Monash University, spending time at both institutions to enrich their research experience.